Funeral Service: 1PM, Saturday, 2/2/2019, at St. James Lutheran Church of Howard Lake. Visitation: 4-8 PM Friday at church and 1 hr. prior to service on Saturday. Prayer service: 7 PM Friday. Interment: Howard Lake Cemetery. 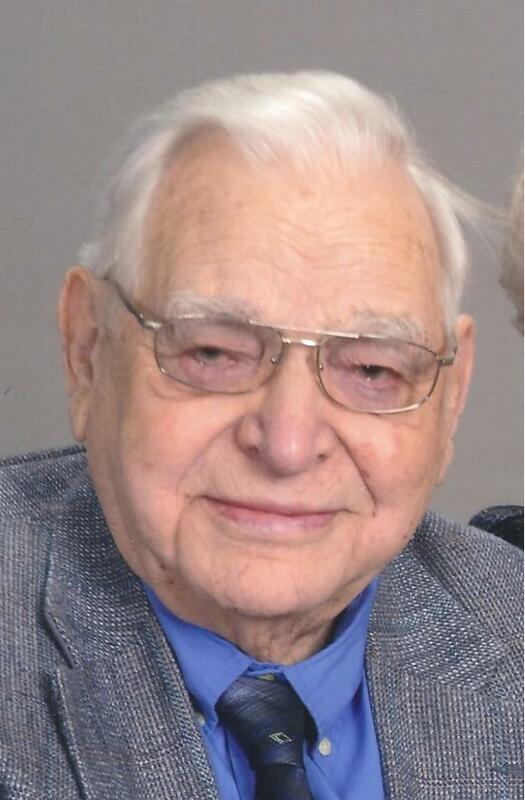 Elwood “Woody” Louis Engel, age 93, died peacefully on Wednesday, January 23, 2019 at the St. Mary’s Care Center in Winsted, MN. Woody, a lifelong resident of Howard Lake, was born October 8th, 1925 in Woodland Township (Waverly, MN) to Louis & Alma (Schendel) Engel. He was baptized and confirmed at St. James Lutheran Church in Howard Lake by Reverend C. G. Seltz. He was baptized on November 8th, 1925 and was confirmed in his faith on April 10th, 1938 with the Bible verse Luke 11:28. He graduated from Howard Lake High School in 1943. Woody met Marvel Kobow at a dance at Lake Sarah in 1947. They were married a year later on June 12th, 1948 and celebrated 70 years of marriage this past June when he sang a song to her that he had written for their 70th anniversary celebration. Their marriage welcomed 4 children: Mary, Jim, Diane & Sandy. Over the course of his life, Woody farmed with his parents, drove milk truck and operated Engel’s Truck Service for over 50 years until retiring in 1994. Winters were busy selling snowmobiles (Moto-Ski, Sno Pony & Speedway) along with snow plowing at area businesses, homes and churches. Woody served on numerous church boards and provided the equipment & materials to construct parking facilities at St. James Lutheran Church and Shepherd of the Lake Lutheran Church (Garrison, MN). Woody enjoyed spending summers at the family cabin on Bay Lake near Garrison, MN and later being a ‘Snowbird’ in Mesa, AZ. At other times he could be found fishing on Mille Lacs, Bay Lake or Howard Lake. He loved traveling, visiting and playing cards with family & friends. He received the nickname “Woody” in 3rd grade during recess when the boys at the Dutch Lake Elementary School were debating on his nickname as being either “El” or “Woody”. They voted for “Woody”, and the name stuck with him during his entire life, but his mother always said his name was “Elwood”. He was preceded in death by his parents Louis & Alma Engel; daughters Mary (Engel) Forsythe & Diane (Engel) Greeley; grandson Daniel Greeley; son-in-law Donald (Butch) Forsythe; brother Vernon Engel; sister Evelyn (Engel/Erickson) Wallentine; nephew Mark Erickson; brother-in-laws Oliver Erickson & Ron Wikstrom. Woody is survived by his wife Marvel; children Jim & Sandy (Ken); sister Jean Wikstrom; 6 grandchildren; 8 great grandchildren; nieces; nephews; great nieces; great nephews; a host of other relatives & friends.